CleanMail's highly versatile filter architecture provides an open interface that allows you to integrate a wide range of third-party tools, e.g. for email classification, automated mail processing, server-based email encryption, or virus detection. The CleanMail setup optionally installs the ClamWin anti-virus package to protect you against all kinds of virus attacks. 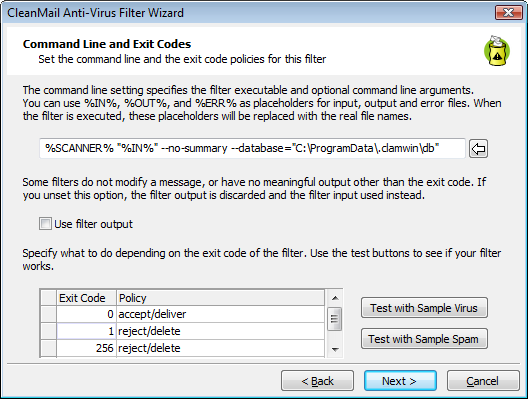 Furthermore, CleanMail supports all third-party virus checkers that provide a command line interface. If the virus scanner you are currently using is not yet on the list of supported scanners, just choose 'Other' on the first page of the antivirus filter setup, and configure the AV filter command line, and the action to take depending on the scanner exit code yourself. Please consult your antivirus software's documentation to find out command line options and usage instructions.